Three years ago, Oakland reinvented itself as the new arts mecca of the East Bay. While not as developed as SOMA or the Mission District, it had a lot more potential. For any artist priced out of a recently gentrified neighborhood in San Francisco, Oakland was the new hip place to go. In 2006 eight galleries from the Uptown and Temescal neighborhoods coalesced to form Oakland Art Murmur, the coalition that would organize the city's popular First Friday event, featuring synchronous receptions at what now involves about twenty galleries. Oakland was already populated with a multitude of below-the-radar art spaces, but around that time it also saw the emergence of several for-profit galleries that employed a more traditional business model. For a moment, it looked like Oakland might become a nationally significant art market. The eight hundred pound guerilla of the scene was Esteban Sabar, whose gallery, located right off of Telegraph Avenue, had a much more conventional approach than most of its counterparts. Sabar made his share of friends and enemies in the scene, and made no bones about his commercial aspirations. He sold art at real market prices. He aggressively courted the media. He occasionally worked with guest curators, but steered clear of any ideas that were purely fringe. Then, four months ago, Sabar shut his doors with no warning, and unceremoniously left the Oakland scene. The gallery owner told people in the circuit that he had shuttered due to bad real estate investments outside the art world (he has since moved to family land in the Philippines). Most people hold this story to be true. "The rent was so low on that gallery that he didn't need to be terribly profitable," said Art Murmur cofounder and local art critic Theo Auer. "He could have been modestly profitable and he would have been fine." Regardless of the circumstances, Sabar's absence left a gaping hole in what had looked like a promising scene, said Johansson Projects founder Kimberly Johansson. "He had a different style but it was still a labor of love and was a shame to see him choose to move on. He talked to his visitors about buying from his gallery without shame, in a way only he could get away with — and he sold more art than most." The reality, Johansson continued, is that most galleries go through a long investment period before their owners get a paycheck at all. "In my case I'm using funds I saved up from my previous job," she said. If a fledgling gallery owner can survive that first two years, build a reputation and garner patronage from the art community (both locally and beyond), then he or she has a shot. Unfortunately, that's a tall order for anyone who doesn't have savings (at least a year's worth, said Johansson), or a financial backer. During an economic recession those challenges get compounded, since it's much harder to sell art or find people willing to invest in a risky market. Two months after Sabar quit the scene, Oakland also lost Industrielle, another gallery and boutique that had launched two years prior in downtown Oakland. In an op-ed piece published in Oakbook on November 23, gallery operator Dana Taylor blamed the bad economy. "Part of being a good business woman is about knowing when to quit," she wrote. "The galleries with staying power are just gonna have to be really creative during this time," said Swarm Gallery director Svea Lin Vezzone. "People are tightening their purse strings and not spending as much on art." Swarm is one of the higher-tier galleries in the East Bay. It is professional but not crassly commercial, and it mixes expensive work by artists of relative stature with pieces that fall at the lower end of the market spectrum. (Current exhibition Final Dream Fringe features a large sculpture priced at $30,000, alongside a small $275 piece; the gallery's biggest sale last year was a $17,000 installation by Kathy Aoki.) "We're more experimental emerging market and so our price points are pretty low," said Vezzone, explaining that she has only been in the field for as long as she has been open — about two years. Vezzone has buttressed against the capricious economy by diversifying her business model. She rents out the gallery space for events, usually at $300 an hour, although she subsidizes her rates for nonprofit clients. These event rentals constitute a portion of Swarm's revenue stream, along with art sales and a consulting business that Vezzone is still developing (she helps architects integrate artwork into their buildings). But the bulk of her earnings come from ten studios at the back of the gallery, which she leases to working artists for $225 to $575 a month. "It's a great opportunity to get exposure," Vezzone said, explaining that patrons can walk through the studios during gallery openings and see what Swarm's tenants are working on. Meanwhile, the experimental gallery and performance space 21 Grand has been mired in its own financial predicament. Directors Sarah Lockhart and Darren Jenkins are trying to come up with about $100,000 to bring their building up to code, and negotiate with the owner to see if they would help bankroll such things as a sprinkler system and seismic retrofit. If the owners don't acquiesce, 21 Grand might have to move again — its third such move — and Lockhart notes that rental prices for commercial property don't seem to be declining in Oakland. Unlike Johansson Projects, 21 Grand does not operate on a standard gallery model. Most of its exhibits comprise large-scale installations of conceptual work, and its revenue comes from music shows and concessions (which went down this year, since fewer bands are touring and fewer people are going out), and an annual art sale. About 10 to 15 percent comes from grants, Lockhart said, which also decreased this year. She added that galleries featuring programs for children, such as the Crucible, Pro Arts, and Rock Paper Scissors, are better-equipped to weather the economic slump, since Oakland's Cultural Funding Program gets a lot of flack whenever it tries to slash services for youth. "I'm just trying to imagine someone making a living just doing sales," said Lockhart. "I mean, Esteban Sabar closed. Most places that have been in Oakland for a period of time, a good portion of their money comes from something else." Cases like that of Industrielle and Esteban Sabar suggest a degree of impermanence for an art scene that's already pretty transient. While spaces such as 33 Grand — funded entirely from director Alex Munn's personal coffers — managed to fizzle out without anyone really noticing, the loss of two higher-end galleries really made a dent. In October, Auer organized a dead art space memorial show at West Oakland's LoBot Gallery with co-curators Derek Weisberger (former director of the now-defunct Boontling Gallery) and illustrator John Casey. Set up as a faux art fair (each "resurrected" space got a drywalled booth to recreate old exhibits, and hang anthropological material documenting the gallery's history), it mostly commemorated low-budget, bottom-rung galleries (Boontling, Liminal, Auto 3321, Magnolia, Papa Buzz, and 33 Grand) that had expired because they had no money or weren't up to code. But the show's aesthetic — a mausoleum that parodied art market capitalism — spoke volumes about the current predicament of art galleries in Oakland. Many of them really are trying to function as legitimate businesses, but in this economy, they often can't do it just by selling art. In truth, it's not so hard to set up a gallery, which is why we have seen a number of art spaces rise up and then disappear in Oakland. Many look undercapitalized and slapdash; their curators frown on capitalism while also disengaging themselves from the academic art world firmament. Some, like Adam Hatch of LoBot, have managed to produce shows of great substance, even if they're not intent on making a profit. Hatch recently took over the space once occupied by Ego Park, in the 23 Street corridor, and rechristened it after himself. His new Hatch Gallery seems to alternate between shows that generate some revenue — he sells work that the average person can afford — and shows that are completely conceptual. This elastic business model indicate that Hatch errs more on the "labor of love" end of the gallery spectrum — i.e., he'll keep laboring until the love runs out. But it also demonstrates that he is an astute businessman. Since galleries don't operate the same way as other competitive businesses (none of them sell the exact same pieces), they're more likely to succeed if the owner diversifies and develops a cult of personality than if he focuses single-mindedly on selling a $40,000 sculpture or painting. Flexibility is the key, said Johansson, explaining that during the initial phase, a gallery owner needs to sustain himself without depending on income from shows. 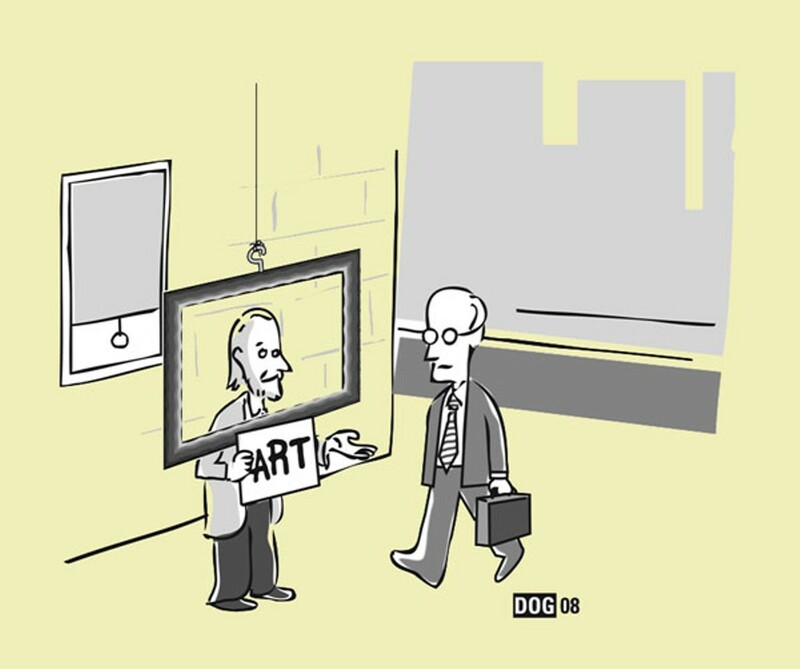 Whichever remaining galleries can weather the growing recession will lead the art scene into its next phase.